I may have mentioned once or twice that my husband and I love Vietnamese food. Well, maybe I’ve mentioned it before. It’s like my love for all things Italian–it comes up often. We usually frequent Vietnam Restaurant (either the Chinatown or the West Philly location) but sometimes when we’re in the mood for a lightening quick and inexpensive meal, we go to Nam Phuong at 11th and Washington in the Wing Phat Plaza. Parking in Wing Phat Plaza deserves a post of its own, but let’s just say it’s always interesting trying to score a spot in the parking lot packed with folks lurking for a spot to park their minivans. There are lots of minivans in Wing Phat Plaza. 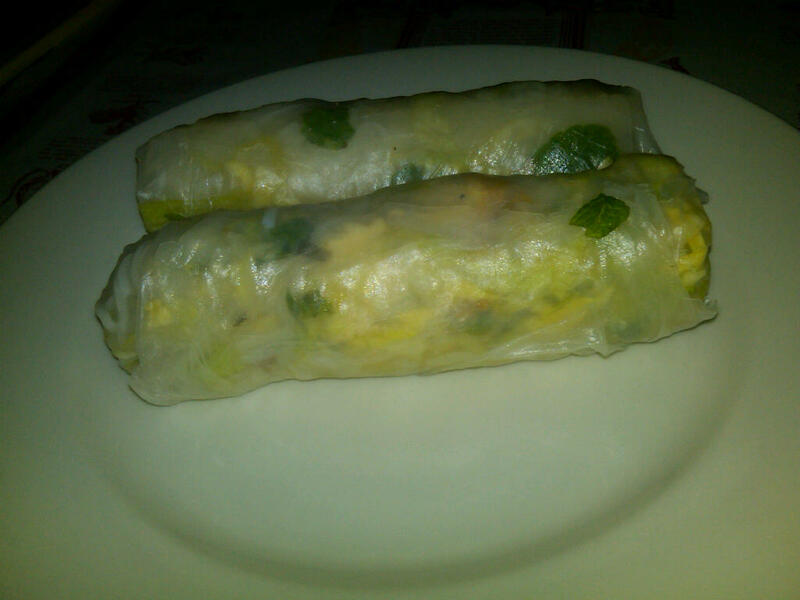 The summer rolls came quickly with the standard peanut sauce. I always take little tastes of the peanut sauce alone because it’s just so darn tasty. There’s nothing especially noteworthy about the rolls but, in a way, that’s why I like them so much. I always know what to expect and there’s something kind of cool about an appetizer that feeds 2 for under three bucks. They may not be as pretty as the ones at Vietnam or Le Viet, but let me tell ya, they certainly do the trick. Before we could even finish the rolls, our bowls of steaming hot pho were placed on the table. Before your pho is served, they give you your plate of “fixins” as I like to call them. 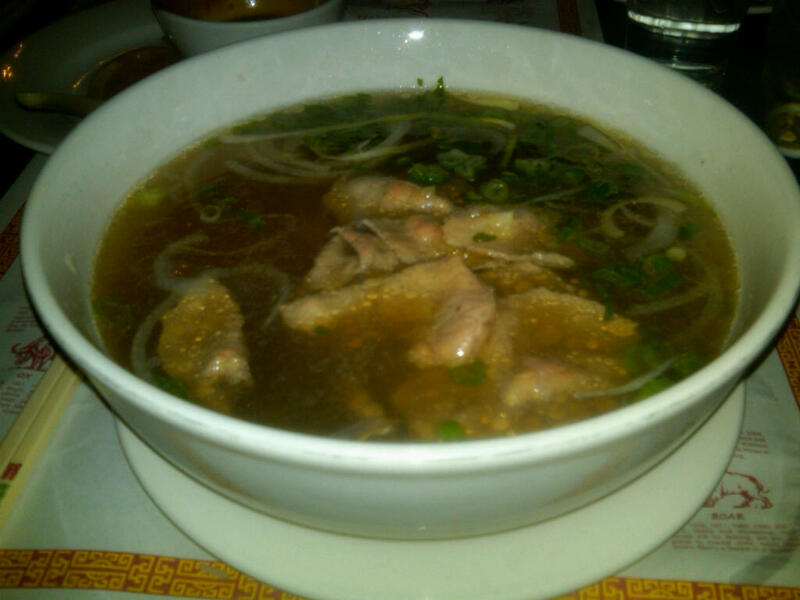 The fixins contain basil, bean sprouts, jalapenos and lime and are mixed into your pho according to your tastes. I like a lot of lime and jalapeno, while the husband steers clear of the spicy. Check out this big ole bowl of noodle soup. The meat is dropped into the soup immediately before it’s brought to the table, so it finishes cooking in front of you. This broth was so rich and full that I could have poured it into a cup and drank it plain. Instead, I fully embarrassed myself, as per usual in authentic Asian establishments, with my poor yet earnest attempt at chopsticks. Folks have tried to teach me for years but I’m a lefty and I hold a pen funny so chopsticks are kind of a lost cause. That doesn’t mean I don’t give it my best effort though! Each bite contained a big scoop of noodles (or whatever size I was able to capture with the chopsticks) along with the crunchy bean sprouts and maybe a hunk of meat if I was lucky. It was divine and I almost forgot how much I probably stuck out as I happily sloshed around in my bowl o’noodles. We left that day with warm bellies and perhaps a few broth stains on our shirts (I wear a lot of black for a reason, folks.) The best part about it? The entire meal was under $20 including tip. If you are so inclined at dinner, you can even get an inexpensive glass of wine or other spirits and you will certainly not break the bank. Just be careful when you’re leaving the parking lot.